"Dr. Biro goes to Washington" is not the latest Hollywood blockbuster, but a rather apt description of what happened at the 2018 AGU Fall Meeting, which was hosted in Washington, DC for the first time. 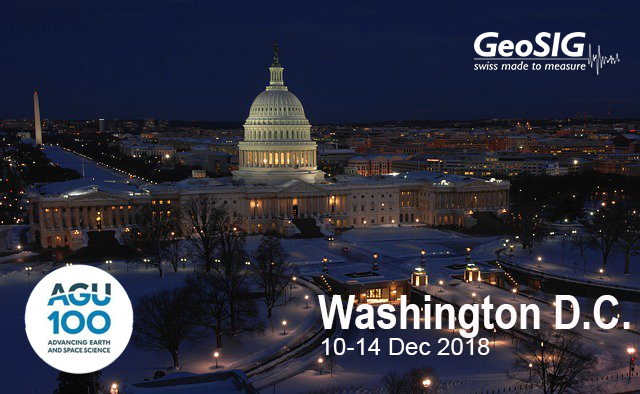 Talhan represented GeoSIG with our Partner Maria Husband of Seismic Systems at #AGU18, which anticipated more than 24,000 participants from 113 countries. He brought a selection of GeoSIG instruments and software, and our structural monitoring shaking demonstration. They met with a wide audience from academia, government, and the private sector to further acquaint them with GeoSIG instruments and capabilities. Fall Meeting was being held at Walter E. Washington Convention Center in Washington, DC from Monday, Dec. 10 to Friday, Dec. 14. GeoSIG's booth (#943) was adjacent to NASA's massive booth in the centre of the floor. We invited everyone attending AGU18 to stop by and say hello to Talhan and Maria.